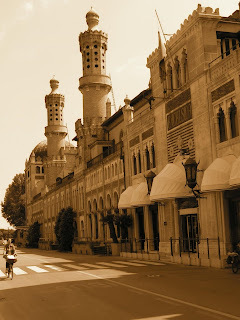 Venice's Ghetto was the first segregated Jewish community in Europe. It was created by the Venetian Republic in 1516 to placate the Roman Catholic Church, which had forced the expulsion of Jews from many European countries. (The Venetians were more interested in wealth on Earth than in religious ideology; if creating a nighttime dormitory quarter was required to keep a community of Jewish financiers and goldsmiths intact, that was good enough for the Republic). The Ghetto has several interesting characteristics, such as the low-ceilinged, multi-storey apartment buildings that were built to accommodate a dense Jewish population and the upstairs synagogues that served Jews of different nationalities. The Ghetto is easy to reach: As you're walking toward the city centre from the railroad station, turn left after crossing the Ponte delle Guglie and look for the Gam Gam restaurant. Turn right into the passage before the restaurant; you'll first encounter the Ghetto Vecchio, or Old Ghetto. 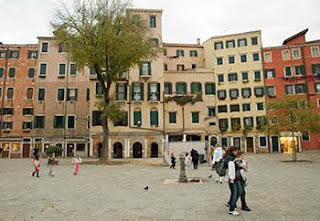 Beyond that is a larger square, the Ghetto Nuovo or New Ghetto, which is shown in the top photo above. Interesting fact: Venice's Jewish population fell sharply during World War II, when many Jews were shipped off to concentration camps, but it has grown in recent years because of an influx of Messianic Jews from the other parts of Italy and the United States. To experience the "real Venice" (and no, it isn't completely gone), head into the side streets away from the major thoroughfares like the Strada Nova and the big squares such as the Piazza San Marco. We've already mentioned the Basilica di San Marco, but there are scores of other churches in Venice that are worth your time. Some have modest admission fees (you can save money with the Chorus Pass), but some are free. The largest and most famous of the no-admission churches is another basilica: Santa Maria della Salute (shown above and at right), which is near the mouth of the Grand Canal and the Dogana di Mare (Venice's old customs house) at the tip of Dorsoduro. The massive eight-sided church sits on more than 100,000 wooden pilings. It was completed in 1681 as a "thank you" gift to God and the Virgin Mary for allowing the plague to kill only a third of the city's residents. Admission is free between 9 a.m to noon and 3 to 5:30 p.m., but there's a small charge to visit the sacristy. 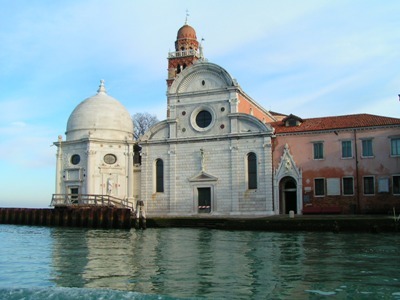 On the island of Murano, you can enter San Pietro Martire (inset photo) free of charge, but there's a small admission fee at the more interesting Basilica dei Santi Maria e Donato. At other churches, admission may be free out of season, when there aren't enough visitors to justify having a ticket vendor on duty. (We wandered into the Gesuati church on a weekend in November, and there was nobody around to collect the admission fee.) Admission is also free during religious services, but you'll be expected to grab a spot in a pew and worship instead of wandering around with a guidebook in hand. San Michele, Venice's public cemetery. The walled island is only a few minutes from the Fondamente Nove vaporetto stop, and it's a surprisingly cheerful place to visit. The Catholic sections are well-maintained, with high-rise mausoleums for the residents' bones (which are usually removed from underground graves after 12 years), while the Reformed and Orthodox sections have the atmosphere of old British or New England churchyards. Murano, the center of the Venetian Lagoon's glassmaking industry since 1291 A.D. You can visit a factory and watch a glassmaker at work without paying (or buying) anything. The island also has several nice churches and two glass museums, one of which--the Barvovier and Toso Museum--is free. 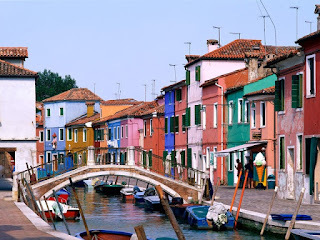 Burano, traditionally Venice's lacemaking island, which has an interesting lace museum (admission charge) and is famous for its brightly painted houses. A wooden footbridge connects Burano to Mazzorbo, a satellite island with a modern council-housing estate that's worth visiting if you're intrigued by architecture or urban design. Torcello, which once had a greater population than Venice and is just a few minutes from Burano by a connecting boat line. Even if you're on a tight budget, you should pay to visit the thousand-year-old cathedral with its stunning Byzantine gold and stone mosaics. Buy a combination ticket that includes the tower, which is easy to climb and offers great views of the island and the Lagoon. You'll reach the islands on motoscafi (water buses) of Actv, the Venice public-transportation company. 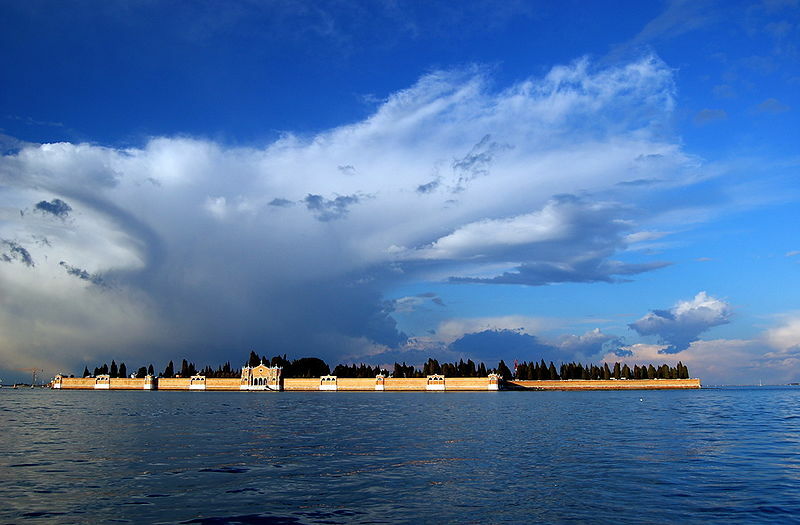 Allow a full day for the entire excursion, or half a day if you skip San Michele and the Lido. • Take an escorted tour of Murano, Burano, and Torcello. • Hire a water taxi by the half-day or day, which could easily cost several hundred euros. 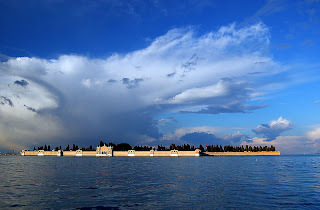 If you want the services of a private guide, try a customized lagoon itinerary from WalksInsideVenice or the Venice Tourist Guides Association and let the guide arrange transportation.